McGill’s commitment to becoming greener has seen a huge amount of time and effort being put into making the University more energy efficient – including its numerous labs. The hard work paid off recently when McGill’s crown jewel of sustainable construction – the Life Sciences Complex – received a significant feather in its cap: the designation of a LEED Gold certification. You don’t often hear the words ‘laboratory’ and ‘sustainability’ in the same phrase. Traditionally, labs and the buildings in which they are housed, utilize vast amounts of energy for heating, water and electricity. But since the early 1990s, McGill’s commitment to becoming greener has seen a huge amount of time and effort being put into making the University more energy efficient – including its numerous labs. The hard work paid off recently when McGill’s crown jewel of sustainable construction – the Life Sciences Complex – received a significant feather in its cap: the designation of a LEED Gold certification. The Complex is the first university laboratory in Quebec to earn the prestigious gold. Leadership in Energy and Environmental Design (LEED) is an internationally accepted benchmark for the design, construction and operation of high performance green buildings. Administered by the Canada Green Building Council (CaGBC), LEED counts sustainable site development, water efficiency, energy efficiency materials and indoor environmental quality among its crucial elements towards successful sustainable building. Points are given in each category. The higher you score, the higher you rate. 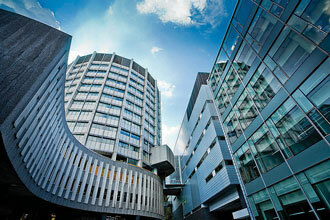 Initially, McGill officials were aiming for a silver LEED certification. However, after the new construction went through the lengthy process of evaluations to ensure proper adherence with the rigorous energy efficiency standards set out by CaGBC, it was announced that it exceeded those early expectations and had earned a gold rating. What went into earning the gold rating? For starters, there’s the green roof – McGill’s first – a covering of hardy, drought-tolerant, sun-loving plants that mitigates the urban heat island effect (a phenomenon that, among other things, lowers air and water quality) while spelling out the word “vie.” There’s also a 50,000-litre cistern which stores the rainwater captured from the reflective roof and is used for toilets and urinals and cuts potable water consumption by 50 per cent. And there’s the increase in natural lighting that reduces the need for artificial lighting in offices and labs. The energy conservation initiatives boast an efficient HVAC (heating, ventilation, and air conditioning) system that makes the Life Sciences Complex 38 per cent more energy efficient than the Canadian National Model Energy Code. As well, 30 per cent of the building material used contained post-consumer or post-industrial and more than 20 per cent of these materials were locally sourced or produced. For Michel Tremblay, Director of the Rosalind and Morris Goodman Cancer Center, the Life Sciences Complex is proof that sustainable lab spaces are not only possible, they have become essential to research. “This is an environment that is friendly, clean with plenty of light for the activity of our students and researchers,” he said. “Not surprisingly, considering the quality of this environment, since the opening of the complex we have seen our research funding and successes increased by over 10 per cent per year.